Our world is becoming increasingly programmable, due to a number of emerging trends. One trend is that increasing quantities of useful public data are being made available over the web in machine-readable forms. Another is that many of the devices around us are becoming ‘smart’ and connected, capable of feeding real-time information on their surroundings into the web and (to a more limited extent) of reacting in response to commands issued via the web. Then there’s the fact that many of us these days carry smartphones: powerful computers with a near-permanent (depending on service provider) Internet connection. We therefore don’t have to be sat in front of a PC to interact with this brave new world of data and devices. This article, the first in a three-part series, looks at how data from devices becomes web-accessible and considers the different data formats that are commonly used. Part 2 surveys some open data sources. Part 3 explores how we can write programs in Python to acquire and process data from these sources. Note: these three articles are aimed at people who have some experience of Python programming but who don’t have much familiarity with data sources or data formats. The articles are based on material originally delivered as a workshop for IT teachers, with the aim of showing them some interesting projects that their students might do once they have learned a bit of Python. Advances in networking technology and falling hardware costs have resulted in a proliferation of small devices that sense their environment and make these measurements available over the web. 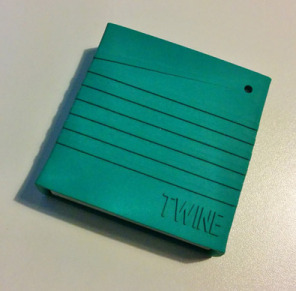 One such device is the Kickstarter-funded Twine. A Twine contains internal sensors for temperature, orientation and acceleration. You can also connect external moisture sensors and magnetic reed switches produced by Twine’s manufacturer, or sensors of your own design via a special ‘breakout board’. 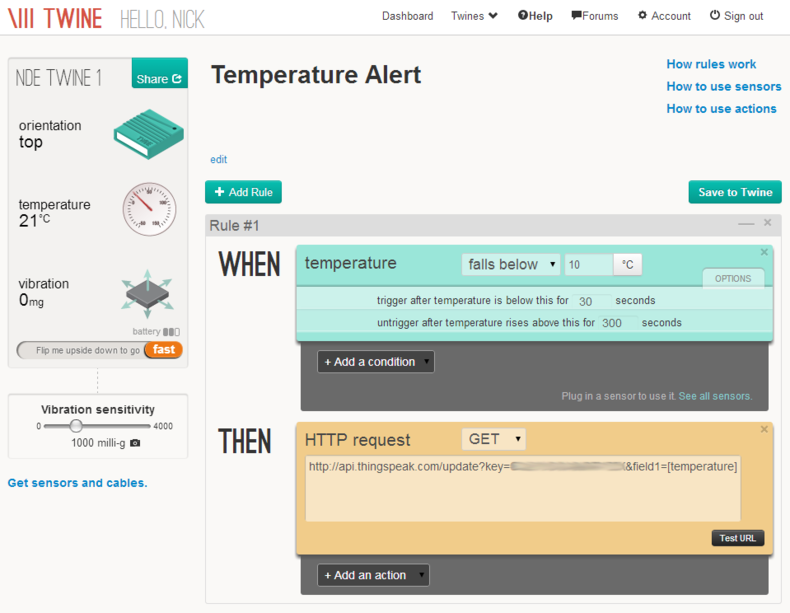 A Twine is programmed with rules based on data from its sensors and uses a Wi-Fi connection to issue notifications via email, SMS or HTTP when these rules trigger. This Wi-Fi connection is also used to update the device with new or modified rules, which are programmed in a visual manner via a straightforward web-based interface. Rules take the form ‘WHEN condition THEN action‘; an example can be seen in the screenshot below. Notice in this screenshot how this particular Twine has been programmed to send data to a web API hosted at thingspeak.com. ThingSpeak promotes itself as an “open application platform designed to enable meaningful connections between things and people”. Once you’ve registered with ThingSpeak, you can set up public or private channels for your devices, through which data are made available for visualisation or downloading. Why not try this out now? Head over to https://thingspeak.com/channels/public to see a listing of some of ThingSpeak’s public channels. Click on the link to one of these channels to see the data feed visualised, then click on the Developer Info tab at the top-right to see the formats in which you can download data from this channel. ‘Comma-Separated Value’ format is the simplest of the three formats offered by ThingSpeak, best suited to data that are tabular in nature. One big reason for its popularity is that spreadsheet applications such as Excel or LibreOffice Calc can open CSV files. This is a dataset with three columns, representing a timestamp, a unique identifier for the measurement and the measurement itself (a temperature in this case). A comma is used to separate the values in each column. (If the value itself contains a comma, this must be protected in some way - e.g., by enclosing the entire value in quotes.) The first line contains the column headings. For very uniform data where all the records have the same structure, CSV is a good choice, not least because it has a very good data-to-markup ratio. In this example, the markup consists of the first line and then only two commas on each subsequent line. Most of the text is useful data. Extensible Markup Language (XML) is very flexible because it allows you to define your own elements that describe the data. Most (though not all) elements enclose data within a start tag and end tag - for example, <name> and </name>. Attributes can also be associated with an element if required, using a ‘key=value’ format - for example, <latitude type="decimal">...</latitude>. (Electric Imp, TI TMP102 sensor, 4 x AA Energizer L91). The use of name-value pairs rather than start and end tags helps to reduce the storage requirements considerably. 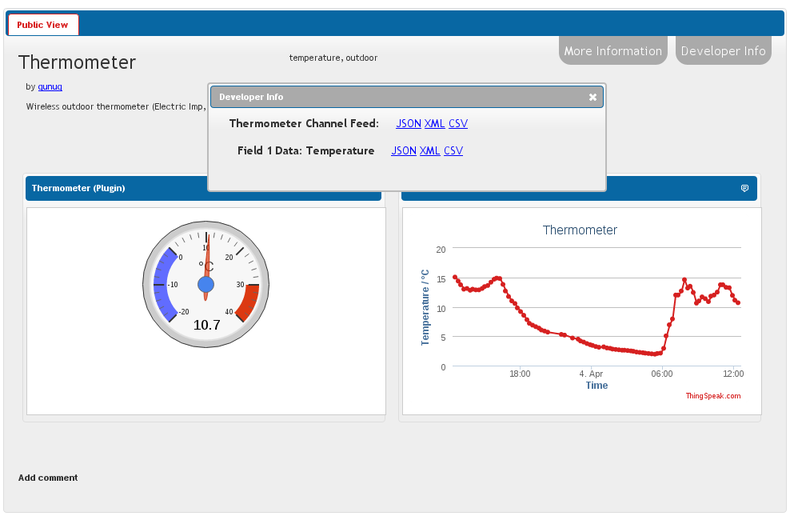 The temperature measurements in this data feed occupy half the space of those in the XML data feed.